We had a ton of great entries for Character Contest 65 - Gemini, so many thanks to everyone for their awesome submissions! As usual, I've picked out some of the ones I considered the very best, or the funniest, or that simply have some feature that I thought exceptional enough to bring to your attention. If yours isn't listed here, that doesn't mean it wasn't good, it just means that in the opinion of one Internet blowhard (i.e. me), it wasn't quite up to the level of some of the others for one reason or another. 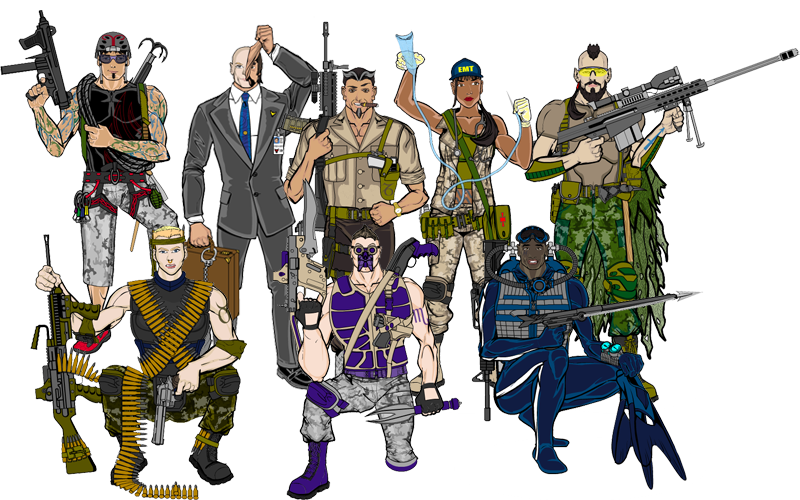 First, I feel obliged to give you Mark Shute's latest addition to the Zodiac Commandos, his "cheap GI Joe rip-off" team, the chameleon-like spy, Gemini! Cliff's "Tweedle Dee and Tweedle Die!" 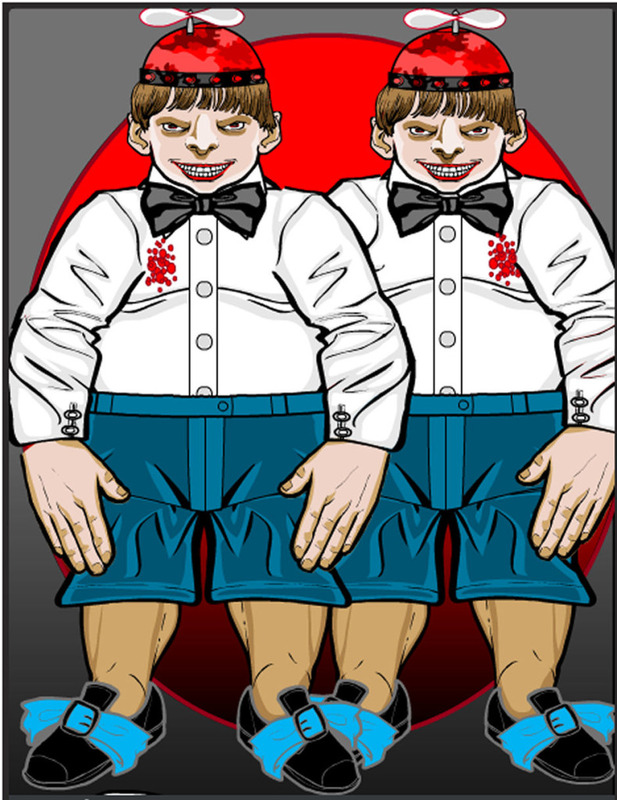 is a great name for these two psychotic little twin brats. Definitely creepy. 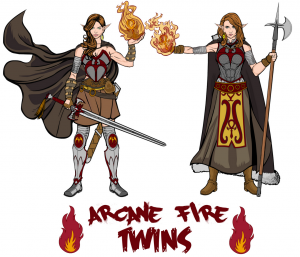 Felipe S. Card's "Arcane Fire Twins" is just a really well done fantasy duo. 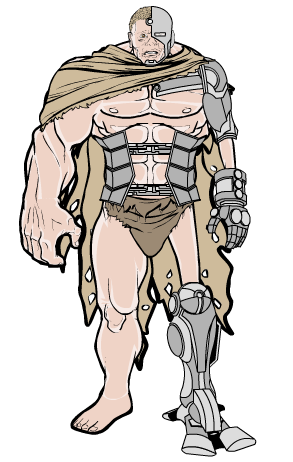 Firecracker's concept was the joining of two separate individuals into one via the creation of a cyborg, which I thought was kind of a neat take. I love the huge limbs on one side countered by the withered ones on the other. The cape works really well, too. Joel's visual pun gave me a chuckle, so now I inflict it on you as well. Kaldath's "Mejeer Twins" features great outfits in a fun and interesting pose, all in front of a simple but nifty background design element. 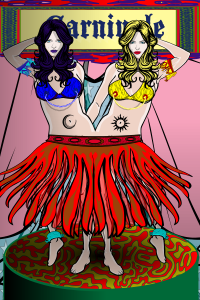 I liked Meniukas' idea of conjoined twins dancing in a carnival (or at Carnivale), particularly the nice touch of them each having their own navel tattoo. I can imagine them wanting to each have their own identity in whatever small way, and that totally fits. Nice job on the drop shadow of the, um, breast chains, too. 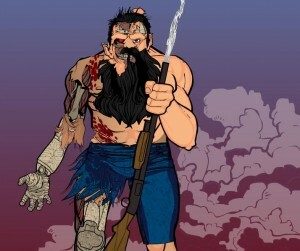 MSCat makes a triumphant return this week with his "Brains and Brawn". I would like to note for the record that a) I have a much bigger belly than this and b) I rarely wear a belt with my blue underwear, no matter how uncanny the resemblance to the guy in the green tube otherwise. I believe newerlie is one of the first-time entrants this week, though from the look of the image you'd think he or she is a long-time veteran. I love the way the dark clouds help separate the composition, and the echoing of the purple leaves through both the figure and the fog. The two characters are similar enough to be twins, but not identical, which I think is also cool. Just an all-around excellent illustration. PapaKrok went with the cyborg concept as well, with what I privately think of as "Hillbilly Terminator". PapaKrok also put together this fantastic image of conjoined demon twins. I love, love, love this illustration. The subtle shading gradient in the background, combined with the flecked pattern and that awesome river of fire and the silhouetted insects are awesome. That allows the cooler colors of the foreground figures to pop right out of the screen. The composition is fantastic, giving the whole image drive, dynamism, action, interest, and power. 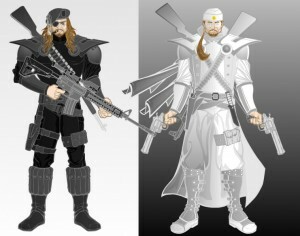 Plus the characters themselves are wicked cool! SeanDavidRoss put some of his posing research to good use in recapitulating the little spot illustration at the top of the original post. The only possible response to Tango's illustration is, "Yes." I actually loved all three of unknownblackpaper's entries this week, but I wanted to try and limit myself to just one, so I am going with "Wings". I love all the cloud effects, especially they way the smoke effect fades out over the white portions. That helps it look more like smoke and less like a pattern slapped on top of everything. 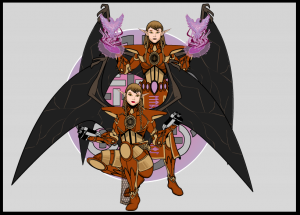 The wings echo a yin-yang symbol, reinforcing the concept of opposite sides of the same coin. I like that they're male and female as well, and the subtle way the bottom wing starts out with the color of the top one, only to fade into white. 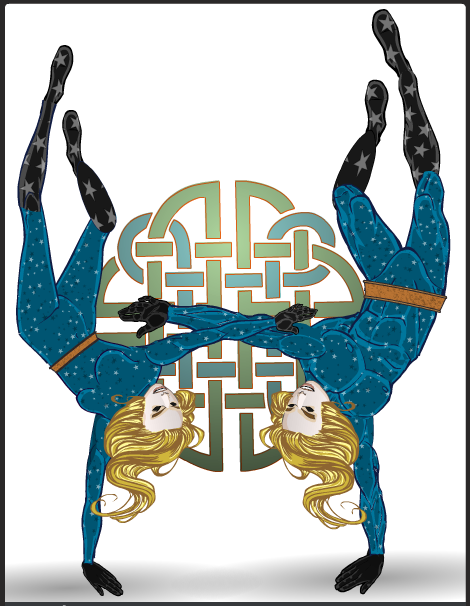 Finally, Whit put together a nifty black and white broadsheet-style promo for "The Amazing Gemini Sisters", sideshow conjoined twins. I love the tiny hats, the nifty joining of the body, and the overall feel of the piece. I do wish there was a bit more black, like maybe a negative-space spotlight on the wall behind them to help it all pop a bit more, but it's a lovely composition regardless. After hemming and hawing quite a while, I ended up with four that I thought were the most deserving of an overall win -- Cliff, PapaKrok's demons, newerlie, and unknownblackpaper's "Wings". I even went so far as to call Mr. Hartwell in as a Guest Supporting Advisory Judge, and between the two of us we ultimately decided that for creative composition and general wicked awesomeness, we'd have to go with ... PapaKrok! Congratulations to PapaKrok for this, his third Character Design Contest win, to all of our Finalists, and to everyone who was willing to share their creativity by entering. I'll be putting up a Caption Contest in a couple of hours, then another Character Design contest next Monday, so stay tuned! And be sure to congratulate PapaKrok for the win in comments. 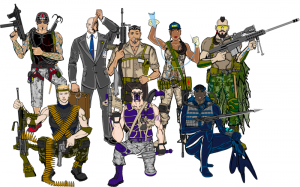 39 Responses to Character Contest 65 Finalists! guess i should have gone more demonic congrats papakrok. Congrats PapaKrok! Great work,as usual. Lots of good stuff by all! 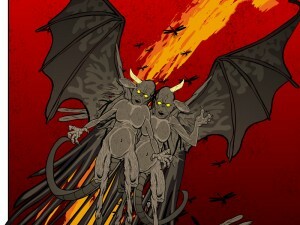 Awesome demons, Papakrok! I didn’t see that one until now. Congrats on the win! Thank you!!! So many great entries here. I’m quite shocked by the contest results…. I have been laughing all day at Tango’s mutant lump and the tiny pink pumps. Not THAT is some seriously funny sh@t!!! AWESOME! And Cliff! We are definitely on the same channel! Finalists all freakin rocked this one. Unknownblackpaper’s entry was beautiful. Between that and Atomic Punk for my favorites actually. Totally out of the box…..
A bow to the masters. Newerlie, damn! You have mad skills…are you sure you aren’t a master in cyberalias mode? Whit, nice! Love the back leg fade…howdyoudothat btw??? SeanDavidRoss, nice integration of the new torsos with existing legs…I’ve been struggling with that a bit. Maybe we should see if Jeff will make us a set of alt ladies legs like the existing ones in for the male??? Tango…that is some seriously disturbed s*%#! And by “…seriously disturbed s*%#”, I mean I love it! Creepy! Yeah. I love Tango’s. The little pink pumps are the best. Grat for all who enter the contest, and especially the winners and more especially PapaKrok. So I know as many men so many tastes. I don’t have favourit pictures between this, but I acknowledge it the composers works. Papakrok, thanks and congrats. I’m consistently impressed by your contest entries. Glad to see you win. PapaKrok, congratulations! You always manage to find new ways to creep us out. And thanks for the compliment, from you, that’s high praise. @ PapaKork: Congrats dude. Thanks. The fade on the back legs is from the circle with vertical gradient found on page 1 of Backgrounds:Shapes. The alpha for primary, secondary and line is set at 0, placed on the layer above those leg pieces, and adjusted accordingly. Tried to make it look like they were stepping into/out of a portal, I think it kind of worked. *@ PapaKrok, sorry for that. You know what I think is neat? The fact that, although we all use the same programme with the same set of materials and limitations, we each develop our own personal aesthetic after a while. PapaKrok is gonna frighten me. unknownblackpaper will inspire me. Cliff will creep me out a bit. Mark Shute will make me laugh. And you know my pics will have a bit of melancholy to them. I think it’s a great testament to both the artists who use HeroMachine and to Jeff, for what he’s created. I cant belive I’m in finals,this is my first contest and Im so glad to be a finalist.Thank you very much. @ PapaKork tnx a lot I like your character too and that face a fantastic. But… my favourite was Atomic Punk Raven twiins. @newerlie: For the first it was very good. Whit N Visage! I totally popped a kork! or rather a flask! I was at the library yesterday and I saw a woman that looked JUST LIKE the symbiot…even had the bowl hair and the pearls. I think I peed a little from fear. I still love those tiny pink pumps. Funny funny stuff. @Jeff: Did you notice that there is a (Click to embiggen.) text under “Wings” that does not do anything?? Thanks unknownblackpaper (32), I didn’t notice that. But it’s gone now, I appreciate the tip. Congrats papakrok! 😀 I really like Newerlies entry! Probably my favourite of the finalists! I also really loved Kytanas works… it’s a shame they didn’t make it to honorables. Late to the party (busy busy week), but congrats to PapaKrok. 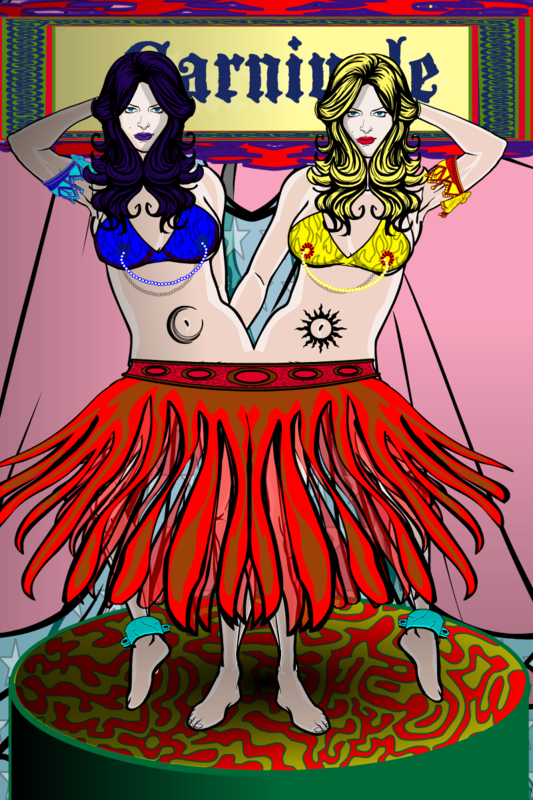 Taking the conjoined twin to one bizarre, awful, artistic step further. I tried for a reflection of the ravens but couldn’t work it. Surprised by the honorable mention. 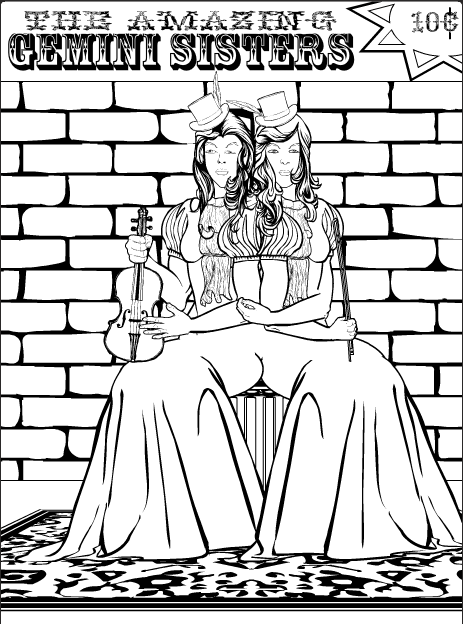 Went with the “dichotomy” theme of a twin. 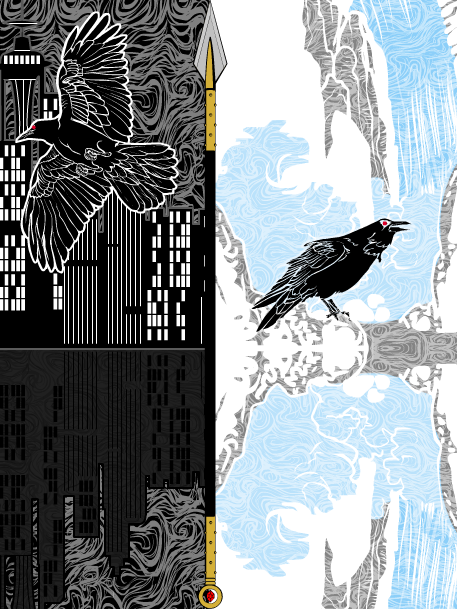 The modern soaring Huginn juxstaposed aside the in nature Muninn. @Kytana: Danke. I love your sphinx designs! Your tribute to “The Never Ending Story” is amazing. You remind of the babe. What babe? The babe with the power. What power? The power of voodoo… *Labyrinth* (and all associated purrs). @unknownblackpaper: Wings is epic. Love it! 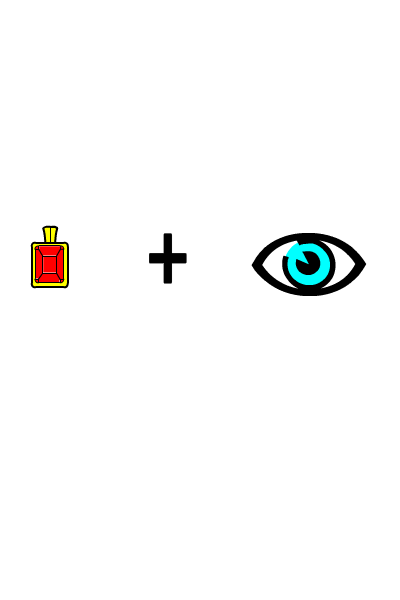 @Whit (24): As you said, we work with this framework of pieces and constraints. But our imaginations run wild. Just amazing how original and complete they are! Glad to see more first-time entries. Don’t be shy. The point is not to “win.” Express, enjoy, engage! I actually create another zodiac signs.I know contest gone but If you wanna see it here. Kicking myself for not having time to be here the last few weeks. 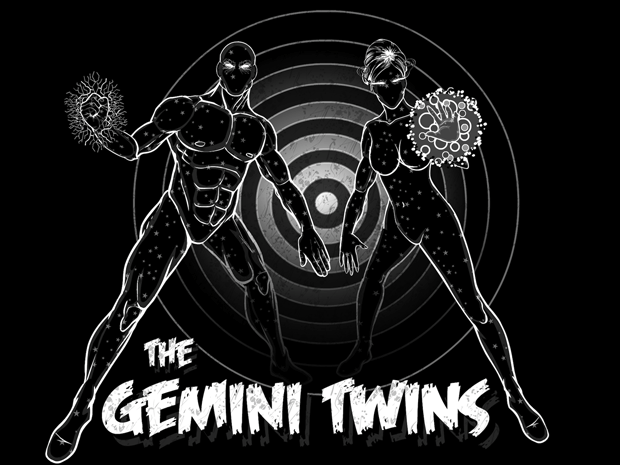 I had some good ideas for Gemini… 🙁 Oh, well. Congrats, all! These contests are just getting more and more fantastic! I especially like MSCat’s—I feel like there’s a really cool story there. And of course both of PapaKrok’s entries are amazing!